For Christmas, my wife Sarah (who knows me all too well) gave me this book, which I dove into with great excitement and interest. 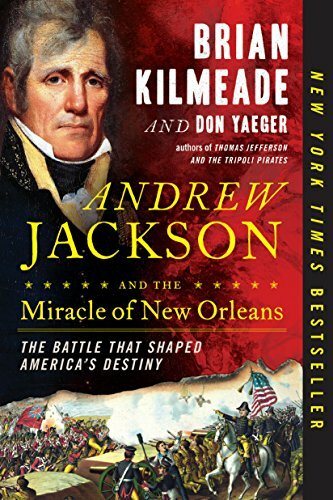 In their fascinating historically focused books, Kilmeade and Yaeger have hit upon a recipe for an engaging narrative. They weave their story around some of the most interesting characters - people we’ve all heard of, but the story takes us through a segment of their life that is little considered by the mainstream. In this book, the central character is Andrew Jackson, who would eventually be the seventh President of the United States. During the War of 1812, considered by some to be a second War for Independence, Jackson worked hard to defend the port of New Orleans. This critical port was ideally placed for a young nation to grow. Losing it to the British, who might keep it or hand it back to other European powers, would eliminate the possibility of further westward growth of the United States, and also severely limit ocean-going commerce during and after the war. The exciting narrative, with an incredible supporting cast of characters including Davy Crockett, will captivate any reader. The suspense is built by a careful introduction to the reader of the background and geographic importance of New Orleans. From there, scenes of battle, intrigue, and even piracy give a Technicolor spectacle that will keep you on the edge of your seat. The War of 1812 comes to live in this exciting narrative. Sarah gave me this book for our fifth wedding anniversary, and I was very excited to read it. It looks like just the sort of thing that would capture my attention. I actually polished this book off in one day! There is a new generation of history books that is really unlike histories of the past. 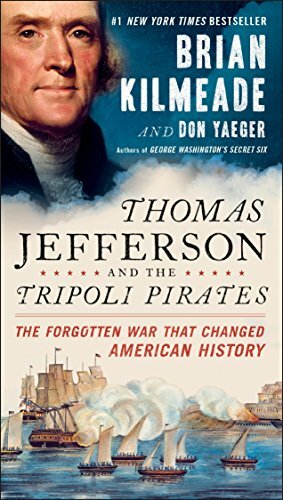 Books like Thomas Jefferson and the Tripoli Pirates, the Killing series by Bill O'Reilly and Martin Dugard, and others provide a window view into the people that are part of the story. You can read about what worries them, how the world looks to them, and how it all fits into the historical activity going on at the moment. History is brought to life! For any larger scope this narrative style would evolve into a massive book that probably would lack important details, but for a specific historic topic it provides powerful insight and imagery. The premise of this tale, then, is that a fledgling United States, with a depleted treasury due to the Revolution and several years under the Articles of Confederation, needs to trade abroad in order to build up the economy. The difficulty is that four Muslim nations, absolved by their religion to attack whom they please on the high seas, are capturing merchant vessels, keeping the ships and cargoes, and enslaving the crews. Large powers such as Britain and France have been paying off these pirate nations for years, ensuring a relatively uninterrupted set of ocean trade routes; but the pirates' demands are so heinous that the United States government cannot reliably pay. The only other solution is war. Thomas Jefferson had argued for a naval power capable of dealing with threats to merchant shipping, and with the outrages visited upon the United States by the pirates, he was able to persuade Congress to raise funds for warships. Eventually, through a combination of bold naval maneuvering and political wrangling, peace is won in the region; but only for a time. This book dives into the real-life characters who were a part little-known part of American history; it reads like a swashbuckling adventure, made all the more exciting by the fact the events are real. Brian Kilmeade and Don Yaeger present a readable and engaging slice of history. I highly recommend it to anyone with even a passing interest in US or naval history. In my reading pile is George Washington's Secret Six, by the same authors. I am now even more excited to dive into that story. Joel Salatin, the lunatic farmer of Polyface Farm in Virginia is absolutely the farmer for our times. I've read several of his other works, and find myself agreeing with, I think, everything he says. His concern and love for God's creation is brought out best in the current book, however, 'The Marvelous Pigness of Pigs'. This is Joel's manifesto - his collected viewpoints on why he runs his farm the way he does, and how the Bible supports his viewpoints on agriculture, sustainability, and health. 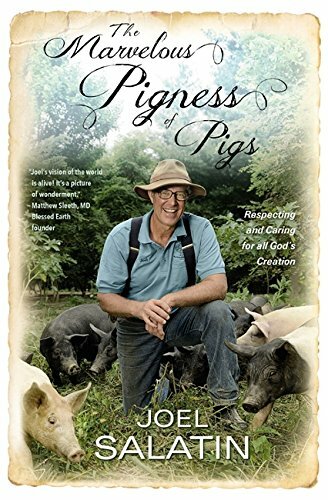 Who else but Joel could look so happy surrounded by beautifully and wonderfully made pigs? Joel's arguments for a land-honoring tradition stand on their own, but in this work he bolsters his arguments with specific Scriptures that paint a picture of a God who appreciates those who treasure His creation - not as pagan groups have done over time, worshiping the creation, but as those who recognize that this Earth was God's first creation. God's gift to us of all natural resources is to be cared for like a family heirloom, it's been passed to use by our forbears, and we will someday hand it down to our own children. That said, too, the body is the Temple of the Holy Spirit. The God who created the Universe, and who paid the precious price of Jesus' blood for our sins, indwells us who are saved through Jesus. We are free in Christ, but we know - and science has proven - that a diet of beer and Buffalo wings is bad for us. Therefore, we ought not to subsist on such foods - we have an obligation to care for ourselves - insomuch as we can only know what science tells us is healthy and unhealthy. I truly recommend this book for Christians, who often need to be reminded of some of the basic facts that modern society tends to be come detached from. Equally I recommend it for those environmentalists, for whom it could be a valuable witnessing tool. Another excellent book by Joel Salatin, "The Marvelous Pigness of Pigs" is a joyous read that had me quoting it all weekend to Sarah and Jemimah. My gratitude to them for putting up with my enthusiasm!